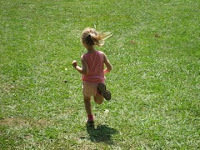 My daughter runs free and laughs every day. She is beautiful and full of life and I delight in her. My son grins at me and snuggles close and and is far more mellow than either my daughter or I (he takes after his father). I know I'm the best mom because my kids tell me so. And I bet yours do, too. I, like every other woman I know, constantly compare myself to other women. I was trying to explain to my husband the other day what it feels like when I don't get the laundry done, lose the 15 pounds I'd like to blame on the baby ( but really are the result of eating cookie dough), have anything interesting to say about the world because I was covered in poop and/or barf today, or generally fail at my self-assigned duties. I don't just think I've had a bad day--I think I'm a bad mother, an unattractive woman, or even worse--BORING. I imagine all the other thin, well-groomed women making their eco-friendly organic dinners with patience and grace as their children play with educational toys and never watch TV. Or, if the moms work outside the home, the thin, well-groomed women pick up a delicious organic meal at Whole Foods on the way home where they then have scintillating conversations about office politics with their husbands over wine and cheese. My reality is that we get take-out at fast food places when I just don't feel like cooking, I'm trying to limit my 4 year old to less than 8 hours of TV a week so she doesn't become antisocial (which I read was a possibility last week), and my husband and I talk after the kids are asleep and during the 18 different reality shows we record on our DVR (can you BELIEVE the 6 people left on Survivor:Gabon?). But then it occurred to me: my daughter thinks I'm the best mom in the world. My son isn't old enough to even know there ARE other moms out there. I am their MOM. Sharing with other moms has always made me feel better so I thought I'd create this blog as a way to share my tips--gleaned from my own life and the lives of friends--for being the best mom in the world. If you don't think it's possible to be the best mom, just ask your kids. They really are the best judges of character.